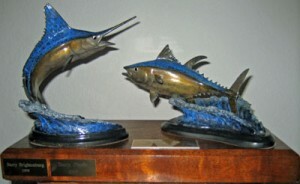 Homer Johnson joined The San Diego Anglers in 1991 as a charter member. He spent many happy days aboard the “Lucky J”, his beautiful 33 foot Laguna. His passion was Marlin and Tuna fishing. At age 82, Homer landed a local 130 lb. 8 oz. Bigeye Tuna on 30 pound test line. Homer’s good nature, perpetual smile and pleasant disposition was always heartwarming and reflected the true gentleman he was. On April 27, 1998 Homer Johnson passed away at age 85. He is remembered as a gentleman as well as a sportsman. In 1999 the club created the Homer Johnson Memorial Perpetual Trophy in his honor. Award of the Homer Johnson Memorial Perpetual Trophy is open to all San Diego Anglers club members in good standing. The object of this year long tournament is to catch the largest qualifying billfish and tuna. A released billfish of any size will be awarded 135 points. A weighed in billfish will be awarded one point per pound with a minimum weight of 135 pounds to qualify. A tuna will be awarded one point per pound with a minimum weight of 30 pounds to qualify. Short-billed Spearfish are excluded. The annual winner of the trophy will have their name engraved on a plaque and added to the trophy, and shall also receive a cash award of $300.00. Fish entered into this tournament may not be entered in the All Around Angler Tournament. Local catches only (within 125 miles of Point Loma). Weight receipt must be marked Other Homer Johnson and must be witnessed, signed and submitted within 30 days of catch. IGFA Rules apply except for tuna hooks. Mexican Fishing Regulations apply within Mexican waters. Released Billfish must be brought to leader (hand on leader) pictures or witnesses must be provided. 135 points for released billfish of any size. Minimum size for a weighed in billfish is 135 pounds. One point per pound for a weighed in billfish 135 pounds or larger. All December weight receipts must be received by January 10, of the following year. The winner gets temporary custody of the trophy for 1 year, after which he/she agrees to return the trophy to the club.